As you may recall, I said I based my Cinderella off Charles Perrault’s Cendrillon, which was written in 1697. 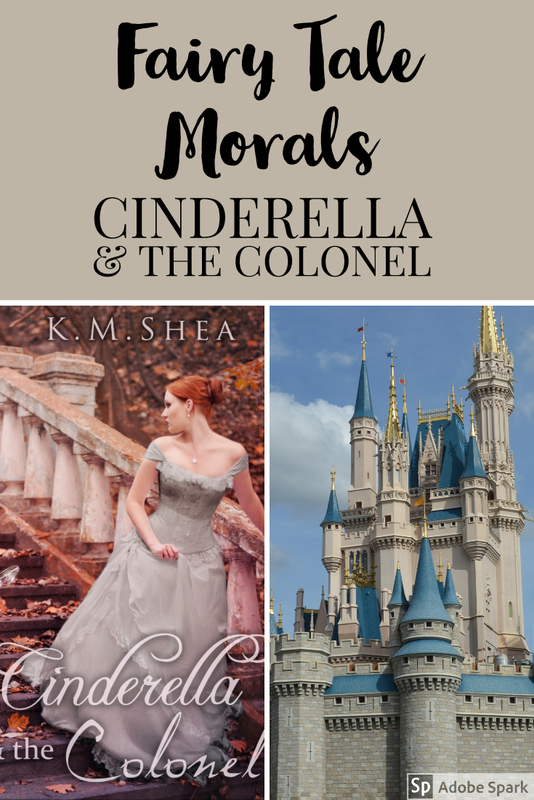 Cinderella and the Colonel strays fairly far from the details of Cendrillon. (Note: SPOILERS AHEAD!) In example: 1) My Cinderella’s father is dead, Cendrillon’s is still alive 2) my Cinderella attends one ball, Cendrillon attends two 3) My fairy godmother uses goats for a coachman and a footman, Cendrillon’s used lizards and rats. 4) Cinderella knows the prince for a full season before she admits she loves him, Cendrillon met her prince twice 5) Friedrich targets Cinderella from the get-go, and knows perfectly well who she is at the ball, Cendrillon’s prince had a super poor memory, and uses a shoe to identify her. I knew I was going to change the romance aspect of Cinderella because I disliked so greatly how stupid Cinderella’s prince was. (Please, who falls in love with a girl and then can’t remember what she looks like?! Even Romeo wasn’t that bad!) I also knew I wanted to get closer to the bones of the Cendrillon story. Perrault was vocal in explaining that the moral of Cendrillion is that beauty is to be treasured, but graciousness is priceless. (Remember, Cinderella forgave her step siblings, who both married lords and also lived happily ever after.) I felt like Perrault’s moral was great, but the graciousness bit of the story doesn’t show up until the last few lines of the story. I killed Cinderella’s father off because I wanted to push Cinderella to the brink of extreme hatred, which would make her relationship with Friedrich more dynamic. I knew I didn’t want Cinderella’s step-family to be the cause of her unusual position. (more on that in later posts) However, I needed an emotionally charged reason for Cinderella’s selfless acts. Her desire to keep her servants gainfully employed was what I came up with–once again giving Cinderella the opportunity to be hateful and spiteful over the taxes and fines. I’ve received messages from Champions and readers who are awed, and perhaps a little disbelieving, of Cinderella’s ability to forgive. They don’t question that it’s in character–Cinderella’s graciousness lies deep in her bones–but they do wonder if someone could actually do that. This takes me back to the Perrault’s moral: graciousness is priceless. There’s no way I could do what the original Cendrillon did. She served her step sisters–who did everything possible to make her miserable–and then forgave them and welcomed them into her courts. That’s unfathomable to me. But I know Cendrillon would do it because that’s the kind of person she is. My Cinderella almost has an easier time forgiving because Erlauf had decent reasons for just about everything they did. Cendrillon’s step sisters had no such excuses. So if you too are wowed by Cinderella’s ability to forgive, I’m thrilled. That means I was able to bring a little bit of the graciousness of Perrault’s Cendrillion into my Cinderella. As for the remaining, notable differences, I decided it wasn’t feasible for Cinderella to attend two balls without being caught. Also, I had my fairy godmother use goats instead of lizards because I wanted Cinderella’s help to be ‘homegrown’ so to speak. It seemed fitting that Cinderella, who sacrificed so much for her servants, lands, crops, and so on, would in turn be aided by her duchy’s servants (with the fine) crops (the pumpkin) and animals. Also, I obviously changed the story in that I had Angelique help Cinderella in addition to Sybilla. Angelique will be involved in every Timeless Fairy Tale I write. That is all for today, Champions. I will see you on Wednesday! I noticed that Angelique… Or was it Sybilaa, mentioned a sleeping beauty I think. ???? ?